jc43089 had the most liked content! I have a UUC flywheel which is very light at 8.5 lbs and I use the mix of Redline fluids that they recommend. There is still a little rattle but not much. It is good advice. Yes, they know problems happen and they seem to ignore them. They should have a process after a failed sale to contact the next bidder because usually the second highest bid is not far behind. Or some process to refund the listing fee or relist for free. Although a relist sometimes doesn't do as well as the original. I also thought that it was not good that they listed another V70R when mine was halfway through, they say it takes a few days to go live so let the one finish and then list the other or list them side by side. Although it was a barely maintained one that needed work but "my mechanic says I don't need to do anything" so it was a nice contrast to mine, and mine ended first and sold for significantly more than it did even though it had 80k less miles. Why would you say 80% of cars don't sell? A high bidders credit card is charged for the buyers premium at the close of auction and is non refundable so it costs quite a bit of money to flake out. In the case of a high bidder going to look at a car and then bailing out the only reason I can see that would happen is if the car has problems and is not as described and it would be cheaper to lose the buyers premium and walk away. I will say that I was disappointed that they trimmed my description down and turned it into "BAT style" which caused a lot of information to be only in the comments and people may or may not scroll through all of the comments so there are tons of repeated questions about stuff that should have been in the description. My buyer showed up with cash, was pleased and drove away so I was happy. Let us know how it works out. I would love to replace my plastic coolant tank with an aluminum one, and also need something for the van project. Although with that I can easily mount the tank well higher than the top of the radiator so it shouldn't be an issue. Right, it might bleed out, I'm not sure how I feel about doing that. I was looking for a tank with a small connection down low for the radiator bleed line, it doesn't really matter whether it comes in the top and has a tube to the bottom or just comes in down low as long as it isn't too near the larger hose where coolant gets sucked back in so that any bubbles can rise out of the liquid. Question on that expansion tank. Does the high up hose connection, which I assume comes from the small hose high on the radiator, have an internal tube going to the bottom of the tank? Or is it just a hole into the tank? I've looked at those and never gotten a good answer. The stock tanks have that bleed line go down to the bottom of the reservoir to prevent air from going back into the top of the radiator every time the engine cools. Hot dog! That looks so good. 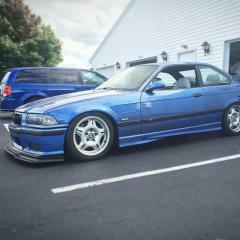 I think the lollipop bushing setup is similar to e30 and e36. For those I always use the stock Lemforder e36 M3 bushing which is still rubber but has more solid area than the non M bushing and very cheap. Loose control arm bushings allow toe change when braking and looseness in general. Excited for this! The fuel pump setup looks just like on an early e24 that I worked on. It's a pain getting the lines up over the tank to the pump, I think I used a small hose and taped the large one to the end to pull it through. Is there a dowel in the starter to position it precisely? I thought there is, you would have to remove that to be able to push it to the outer tolerance of the bolt holes. I was under the impression that the aux pump was to provide hot coolant to the heater core after a shutdown so you can run the heat for a while after shutting the car off. I don't think it has any function for the cooling of the engine. I removed one on an e32 because it was leaking. You need to put oil in the cylinders and recheck. I have seen dry cylinder walls cause extremely low compression. I had a flooded M50 show 30PSI on compression test and with a little oil it jumped back to 180. It also wouldn't start because compression was so low. I just cranked it over with the plugs out and injectors unhooked to dry the fuel away and added a squirt of oil to each cylinder and it started right up. 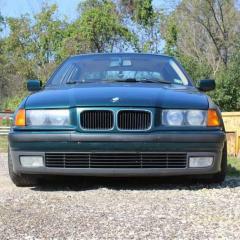 That was on my e36 a couple months ago when it was extremely cold out and had a failed start attempt. I'm going to give it a couple more weeks. My summer wheels have Indy500 summer tires which felt a little loose one cold pavement. And the Generals rip on the rally course, I mean gravel road I live on.